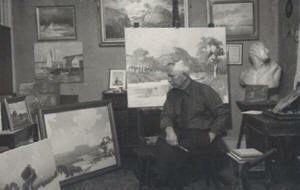 Born in Germany, moved to Galveston, Texas around 1882. 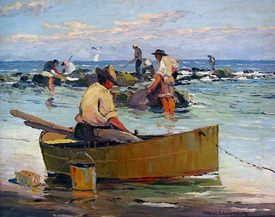 He received early encouragement in art while in school in Galveston. Later he began his studies of art from Galveston artist and marine painter Julius Stockfleth (1857-1935). Schumann is known as an interpreter of the true Texas Gulf Coast. Painting in oils, watercolors and crayon. 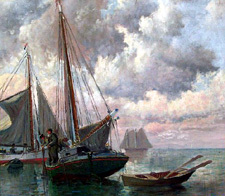 His subjects are mostly of Galvestonians on their fishing boats and sailing vessels in nearby bays and docks and colorful figures along the beach and occasionally landscapes of the Texas Hill Country. One well-known landscape painting is of Enchanted Rock near Fredericksburg, Texas. 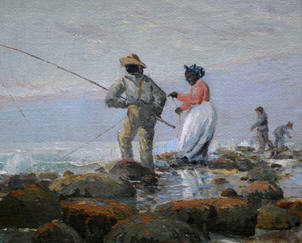 He later painted mostly in palette knife in the impressionist style. Schumann began as a realist and evolved to palette knife painted in primary colors with warm tones of the afternoon sunlight with atmospheric intensity. Awards include: First & second prizes on marines at both the Texas Cotton Palace , Waco and West Texas Fair in San Angelo. He won the “Texas Fine Arts Prize” at the Southern States Art League for the best Texas subject, titled “Mosquito Fleet”. Life membership prize at the Springfield, Illinois Art Association exhibit and purchase prize at Victoria, Texas competition for a landscape. 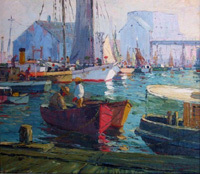 He also won prizes with his paintings titled “Drying Sails” & “Silver Sprays” and entered many other important exhibits of the period including the San Antonio Art League; Dallas Women's Forum; State Fair of Texas at Dallas; Annual Exhibition of the Salons of America, New York & others. 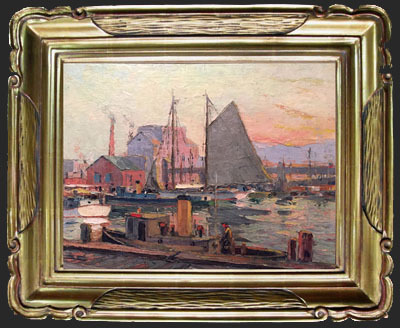 Schumann was a member of the Southern States Art League; Galveston Art League; Texas Fine Arts Association; New Orleans Art Association & the Springfield, Ill. Art Association. We buy and sell fine examples by this Texas Artist and have been a dealer since 1988; buying, selling and specializing in works by Paul Schumann along with other important Texas Artists. Always looking to purchase fine examples of Paul R. Schumann's Texas scenes. Please call or email to discuss your painting and obtaining a free and accurate evaluation & offer or let us know your interest in acquiring art for your collection. Telephone 210.408.7778 Thank you for Visiting.